Social media is a bit like art—most of us are pretty sure we know what it is, but articulating a common definition can be challenging. There are many definitions of social media floating about of course, they just aren’t consistent. Social media “are primarily Internet- and mobile-based tools for sharing and discussing information” according to Wikipedia. It is “the use of technology combined with social interaction to create or co-create value” according to John Jantsch, a “shift in how people discover, read, and share news and information and content…a fusion of sociology and technology, transforming monologue (one to many) into dialog (many to many) per Brian Solis, “online communications in which individuals shift fluidly and flexibly between the role of audience and author” in the view of Joseph Thornley, and “a category of practices, technology, tools, and online sites that are based in social relationships, participation, and user-generated content” in the words of Liz Strauss. My own definition incorporates the 4 C’s of social media, or the “4 Cons” if you will: “online tools that permit users to create content, within a given context, to help establish connections and engage in conversations.” Okay, that’s a bit awkward in words, but makes more sense as a picture: The starting point is typically content—a blog post, video, podcast, article, photo, a resource such as an industry-specific glossary or calendar of events, or other means of expression. The context in this case is the particular tool, website or other online venue where the content will be shared: in a blog, a social networking or bookmarking site, a media sharing site (e.g. Flickr or YouTube), a wiki, a forum, a Squidoo lens, wherever. Sharing content enables one to make connections; to find people with similar interests. For example, someone with an interest in enterprise data warehouse technology will probably read data warehouse blogs, watch data warehouse videos, listen to data warehouse podcasts, and follow people who write about enterprise data warehouse technology on Twitter. Finally, sharing content with those interested in the topic leads to conversations. These can take the form of interaction on a social sharing site like Searchles, blog comments, Twitter replies, LinkedIn messages, writing on a Facebook wall, or other means of online dialog. The online conversations themselves are content (closing the loop), and can also lead to the creation of new content: for example, a conversation with Cece Salomon-Lee that began with blog comments and Facebook led to her writing several guest posts on this blog, and a conversation on Twitter led to me writing a guest post on SEOmoz. However defined, it’s clear that social media embodies a set of tools that enable anyone to be a media producer as well as a consumer, and that force traditional media outlets to now participate rather than just broadcast. As the recent example of Skittles first turning its website entirely over to social media and then pulling back, companies and brands are still struggling with exactly how to best utilize these tools. But with the continuing explosion of new tools and venues for online social interaction, the worst mistake marketing and PR practitioners can make is to have no social media strategy at all. Note: This post was originally published on the WebMarketCentral blog in March 2009. Originally published on the WebMarketCentral blog between September 2008 and September 2009. A great list of the top social bookmarking sites, with visitor statistics, as of late last year. If you are planning to use these for SEO, check for do-follow status first. Unfortunately, several of the largest sites including Digg, delicious, Reddit, Mixx and Mister Wong now partially or completely use insidious no follow links. This compelling and straightforward post tells you how to pitch the value of social media within your company, then provides nine (plus a bonus tenth) reasons why social media marketing can’t be ignored, including: your competition is doing it; you can’t buy links anymore (so you’ll need to earn them; and this simple formulation—”More Social = more Search. More Search = More Customers. More customers = More business.” Builds on the arguments made in Social Media ROI vs. RONI (risk of not investing). Jacob Morgan reviews a report from the Economist Intelligence Unit which concludes that 80% of companies believe social media can increase company revenue. As Jacob writes, “Shocker huh? I mean who would have thought that building relationships and interacting with your customers could possibly increase sales? You know what else is funny? Apparently company CEO’s are the folks who are the most excited about social media!” CFOs are the most skeptical (yeah, another shock). Marko Saric outlines a process for generating more traffic through StumbleUpon, walking through the steps of sharing great content, making friends in the network, and analyzing results. Knowing what not to do in the social media realm is every bit as important as knowing what to do, and in this post Robin Broitman shines the light on social media missteps and gaffes from Target, Motrin, Starbucks, Whole Foods, FedEx and more. Rick Burnes explains three ways that even organizations which don’t have tens of millions of dollars to spend and thousands of volunteers can use social media for marketing and PR, and measure the return. Justin Smith shows how Facebook’s indexing changes, designed to make it easier for potential friends to find each other, will also benefit corporate SEO efforts—at least for companies that can attract lots of fans on Facebook. In Facebook Adding ‘Fan’ Pages To Public Search Listings, Mark Walsh of MediaPost provides additional detail on this announcement and its implications for marketers. Though the title may sound spammy, Jim Connolly isn’t hawking some bogus “Internet marketing” software here. Instead, he offers a positive philosophy and thoughtful approach to attracting worthwhile, like-minded Twitter “associates” (like many Twitters, Jim finds the term “followers” a little creepy). This excellent post a great set of tips (such as “try to meet in real life” and “ask for help”) for turning passive social media connections into active relationships that lead to additional online exposure, leads or sales. Kfir Pravda explains—concisely, thoughtfully and somewhat acerbically—why social media isn’t a magical marketing tool and why “a brand or a political candidate has a Twitter account that is operated by a communication studies freshman” is unlikely to make a difference. He explains how social media, to be effective, requires a significant commitment of time and effort. John Gray explains how to use Facebook, Wikipedia and Twitter as components of an integrated Web 2.0 branding strategy. His recommendations on using Facebook as a CRM tool are an interesting twist, and he astutely notes that while Wikipedia is appealing to marketers because of its incredibly high traffic, it is also challenging because the site is actively monitored by an army of “editors” freakishly hostile to any content that could even remotely be considered promotional. The wise and prolific Rand Fishkin provides thoughtful guidance on choosing a name, avatar and strategy for personal or corporate social media branding and online reputation management. Grant Crowell describes a clever trick for integrating a free call to action with any video you place on YouTube, and even a way to do A/B testing for video and landing page variations. The brilliant, enigmatic Ann Smarty reports on how several major consumer brand companies are using seven different strategies to reach out to customers on Twitter, including direct promotions and coupons (Dell and Starbucks), customer service (Comcast, Home Depot), customer interaction (Southwest Airlines, HRBlock) and sharing company news (Ford, Samsung). In this thought-provoking post, Jason Keath proposes a five-part model of social media: networking (e.g., Facebook, LinkedIn), publishing (WordPress, YouTube…Twitter? ), linking (Mixx, Reddit), interactive (Second Life, NameThis) and niche (Kirtsy, My Church). It’s an interesting taxonomy, a bit different from the social media landscape previously described here, but certainly worthy of consideration. In this insightful missive, Matthew Pollock elaborates on two essential points about social media. The first is that marketers need to choose the right social media platforms to support their business objectives rather than focusing merely on traffic numbers. YouTube generates enormous views, but isn’t appropriate for every brand. Second, achieving results with social media takes time, because it is about building relationships rather than landing the quick sale. The biggest challenges CMOs face in social media are therefore establishing the right metrics for evaluating success and maintaining the effort over time. Proclaiming himself “sick of social media,” Ian Lurie provides a list of quick but powerful steps for taking advantage of it in “a total of 10 minutes a day, because that’s all I can stand.” Okay, even this brief regimen would probably take a bit more than 10 minutes, and he notes that this is a minimum level of participation, but the list is a good starting point and Ian is always an entertaining read. In this truly amazing resource, Peter Kim lists and links to examples of how more than 300 brands are using social media, from Abbott Labs on Facebook to Zappos on Twitter. Looking for ideas on how your company could expand its use of social media? You’ll find examples here that serve as a great inspiration and starting point. A brief post that makes a solid point: blogs have become a primary conduit for corporate announcements and news releases. Got something to tell the world? Pitch an influential blogger on the story. Just make sure you can articulate the news in way that’s interesting to the blogger and his or her readers. Though the statistics quoted here by Steve Mulder are already quaintly out of date (remember when Twitter had only one million users? ), but his advice stands up to the test of time. Steve details helpful tools and techniques for monitoring buzz, sharing information, promoting your product or service (carefully), and using Twitter as a platform for conversations—not monologues. Oddly, Frank Levert had an outstanding list of do-follow social networking sites on his blog, but the URL for that post now just redirects to his marketing site. You can still find his list of 55 Do-Follow Social Networks on Google’s cache for now, however. Noting that “understanding the myriad conversations that are taking place online is core to not only having successful marketing and communications campaigns, but it’s key in understanding how people actually feel about your brand, products and services,” Mitch Joel lists six no-cost tools for tracking social media discussions, from Google Alerts to Facebook Lexicon. Another tool well worth checking out though not on Mitch’s list is the “freemium” version of Techrigy SM2. Guest blogger Catie Foertsch provides tips for producing an effective, professional business video, such as starting with a script, using an external wireless microphone, and setting up proper lighting. In another helpful guest post on the topic of business video, Kate Morris offers tactics for “produce quality videos that spread,” such as producing content that is relevant to your product or service and using a broad variety of media (not just online) to promote your content. Jessica Cameron-Ruud provides detailed notes on this SES panel discussion featuring Todd Parsons of Buzz Logic, Rob Key of Converseon, and Edmund Won from iCrossing. Her post nicely summarizes the panel discussion as it delves into social media strategy, monitoring and measurement (indirect impact and direct engagement metrics), and social media ad design. The creators of SEO analysis tool Traffic Travis present a helpful mini-course on using social media to drive web traffic. Topics include finding popular keywords, generating backlinks, tagging, using WordPress with social media, Twitter, and creating and promoting content. The tone is a bit spammy at times, but the information is valuable. In this follow-up to her original post on 5 Business Social Media Sites You May Not Know About, Kari Rippetoe reviews five more business-oriented social media sites including wiki site Smallbusiness.com and local business site Briz. An organized plan for maximizing traffic to your blog from social media sites, from using search and monitoring to find the most relevant niche social media sites for your blog and connecting with top users through submitting content and evaluating results. Advising businesses new to social media to avoid a scattershot approach and “choose one or two social networking sites that fit your business well and invest the time to maximize your presence in them,” Deltina Hay provides a helpful step-by-step guide to using Facebook for business. Grant Crowell explains why video is a powerful component of reputation management (e.g., because people are looking for it, search engines give it prominence in results, and it’s viral) then provides tips for how to effectively use it. One of his recommendations is to subscribe to TubeMogul, a free service that enables you to upload video to multiple sites and provides detailed viewership metrics. In his own uniquely straightforward fashion, Chris Lang explains how social bookmarking can actually harm search engine rank if not done properly; how (and how not to) submit your site and blog posts to get SEO value from the backlinks; and why your blog is (or at least should be) at the center of all of your social marketing efforts. How to game Digg to get your content onto the front page, by building and utilizing a grassroots network and selectively targeting power users. Which raises the question: is a secret still a secret if everyone knows it? Carol Krol asks search marketing guru Mike Moran, now with interactive agency Converseon, about how search marketing and social media work together, asking customers to take initiative, and the challenges of b2b social media marketing. The top 100 web applications as chosen by Webware readers, across 10 categories including browsing (e.g. Google Reader, Opera and Firefox), audio (e.g. last.fm, emusic and Pandora) and communication (e.g. Gmail, Skype and AIM). Billed as an iterative list of the most value private digital companies that “changes as facts and markets change,” this site shows the rankings of the top 25 online startups as well as 25 more top contenders. Some rankings are surprising (Webkinz is worth more than LinkedIn? ), some are disturbing (the Huffington Compost is worth as much as Twitter?) and many are controversial, as indicated by the comments here. The brilliant Ian Lurie uses hard data from personal experience to show that “there’s a clear connection between Stumblefests and link growth.” StumbeUpon isn’t just great for producing low-quality traffic surges, it also produces more high-quality links over time, which is of course great for SEO. Unfortunately, Ian was recently banned by StumbleUpon, so use this service very carefully. This guest post provides detailed instructions on how to maximize your influence, exposure and blog traffic through the use of this popular social bookmarking site. Be warned that it takes some work, but the results may well be worth it. As far as I know, this author hasn’t been banned by StumbleUpon (yet). Inspired by sources such as Guy Kawasaki’s LinkedIn Profile Extreme Makeover, writer Terri Wells provides step-bu-step instructions for overhauling your LinkedIn profile to get the maximum social networking, SEO and reputation management benefit from it. Contending that “An online marketing strategy includes SEO, PPC, Social Media and even Word of Mouth. With that in mind, there are more segments (beyond those identified in Groundswell: Winning in a World Transformed by Social Technologies by Charlene Li and Josh Beroff) of an audience to take into account when you begin to strategize,” Li Evans engagingly identifies eight other types of users your online programs need to consider, including Brand Evangelists, Promoters and Got To Have It Nows (but watch out for Trolls). What’s hot in your industry? Who’s talking about you (and what are they saying)? To help you find out, David Berkowitz provides a guide to seven of the best buzz monitoring sites, including Twitter search tool Twist, keyword demographics from Quantcast, and blog search engines Trendpedia and BlogPulse. Anthony Kirlew, a.k.a. OldSchool, shows how to dramatically grow the number of high-quality backlinks to your website by using social bookmarking sites and blogs. Blogger David Wilson summarizes a SellPoint/Cormetrics study showing that audio/video “product tours” can increase e-commerce conversions by up to 35%—plus they’re portable, so they can easily be re-used in other online venues. 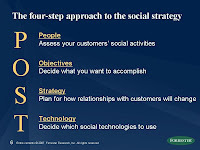 Ex-Forrester VP Elana Anderson provides five strategies marketers can use to harness, rather than manage, the social web for the benefit of their brands. Listening and sincerity are high on her list. DazzlinDonna writes a lot of great stuff on her blog, but here she turns the reins over to social media marketer Dan Zarrella, who offers his tips for maximizing social media including how to best use keywords, comments and links. Search marketer Jon Clark recommends using some of the lesser-known social bookmarking sites—like Mixx, Linkinn, MetaFilter and others that don’t use evil nofollow links—to help with SEO on your site. Plus the post includes this cool graphic from Elliance, an eMarketing firm specializing in results-driven search engine marketing, web site design, and outbound eMarketing campaigns. Clark’s list is good overall, though I’d avoid Slashdot, as the site rejects too many worthy links. Internet consultant Phil Bradley reviews Spokeo, a profile aggregator that takes social networking to a disconcerting level. Actually, they even advertise the service that way on the Spokeo site: “Want to see something juicy? Spokeo searches deep within 40 major social networks to find truly mouth-watering news about friends and colleagues.” As Bradley explains, while the individual pieces of information that Spokeo finds are innocuous enough, “together they paint a picture of a person that is more detailed than I personally appreciate. It must be a gold mine for private investigators, stalkers and other unsavory people.” You might want to look yourself up Spokeo and adjust your online profiles appropriately. A fantastic list of the top 30 social bookmarking sites, in rank order, and including for each site the number of inbound links (as of August 2008), number monthly vistors according to both Compete and Quantcast, Alexa ranking and Google Page Rank. The only thing missing is each site’s policy on the use of insidious nofollow tags. Max Freiert lists the top 25 social networks ranked by number of monthly visits, along with their year-over-year change. Some of the information here is expected (e.g. MySpace and Facebook hold the top two spots) while other findings are more suprising (such as that LinkedIn is only #9, and Twitter—which I use but have never really understood the appeal of—grew more than 4,000% last year). Social Media Expertise Without Experience? This post was originally published on the WebMarketCentral blog in April 2009. In most areas of life, experience with a particular field of endeavor is considered a vital component of expertise. If you needed surgery, for example, you’d probably prefer to have it done by someone who had performed many surgeries before than by an individual who’d merely read quite a bit about medicine. 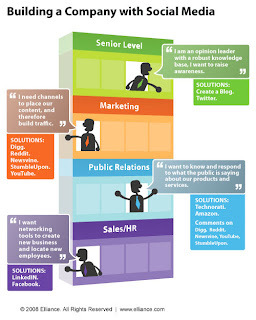 I was recently part of a LinkedIn discussion about what constitutes social media expertise. The general consensus was that the field is so new and still changing so rapidly that almost anyone can claim to be an expert, dubious as that label may be in most cases. Still, most companies could save money and get a better return on their social marketing initiatives by bringing in an outside firm or consultant with some experience, who has clear concepts of social media strategy and an outline of services that can be provided. Ultimately, social media marketing is an in-house activity. No outside expert will ever be able to carry on in-depth conversations about your industry or products the way your own subject matter expert employees can. But an experienced consultant can help create an appropriate strategy for your business, select the right social media tools, and train your staff so you can minimize costs, avoid missteps, and maximize the return on your social media marketing efforts. It’s one of those “brilliant observations of the blatantly obvious” to state that companies should listen to their customers; successful companies have always done that. But the rise of social media and the interactive web present new opportunities, and challenges, for conducting those conversations. Effective social media monitoring requires a significant investment in both tools and time. Does it pay off? If so, how much? A new report from the Aberdeen Group, The ROI on Social Media Monitoring: Why It Pays to Listen to Online Conversation, answers the question and quantifies the benefits. Best-in-Class organizations are 2.6 times more likely than Industry Average companies, and 93 times more likely than Laggards, to improve their ability to generate customer insights that drive new product / service development. 72% of Best-in-Class companies, compared to 42% of Laggards, rank their experiences with social media monitoring as successful. Best-in-Class organizations that engage in social media monitoring and analysis activities are 3.3 times more likely than Industry Average companies, and 82 times more likely than Laggards, to improve their ability to identify and reduce risk to the brand. 78% of Best-in-Class companies, compared to only 8% of Laggards, have improved year-over-year customer retention rates. Increasing customer advocacy and word-of-mouth promotion was ranked as the top social media “pressure” by companies in the Aberdeen study. After that, reinforcing the concept that social media is a powerful PR tool, “protecting brand reputation” and “increasing brand / product awareness” were goals that followed closely. And reinforcing the notion that social media is not primarily a lead generation or direct response tool, “increasing customer acquisition” was ranked near the bottom of the list. Given these priorities, “establishing a method for engaging consumers in online conversation” and “analyzing customer insights to improve marketing campaign effectiveness” were at the top of the list of strategic actions for best-in-class companies. On the other hand, “establishing a method for monitoring benchmarks and goals” proved to be the most challenging tactic, even for organizations that are very good at social media monitoring. While the Aberdeen study focused on large enterprises, many of the results are equally valid for smaller companies. Actually, the top pressures—increasing brand awareness and enhancing brand image—are arguably more important for smaller firms, which lack the large marketing/PR budgets and broad name recognition of larger market players. For small companies, influencing the influencers is another key goal in their use of social media. Bloggers, journalists and industry analysts are among the heavy users of social media, often even more so than customers and prospects. Social media provides an opportunity for small companies to increase their exposure to and by these key sources of influence, which indirectly though critically affects the perceptions of prospective customers searching for solutions. Not surprisingly, marketing and PR groups are among the heaviest users of social media within companies. It’s heartening to see that sales forces are becoming more active as well, given the potential for rich insights into prospect needs and motivations that social media can provide. As prospects spend more time on up-front web research and less actually engaged with sales, it’s critical that sales people research prospects as well, enabling them to ask better questions and get to the heart of each prospect’s issues more quickly. It’s interesting that market research and product development are the lightest users of social media, given the importance Aberdeen reports that best-in-class firms place on using customer insights to drive new product / service development. This is likely more a reflection of the immaturity of social media as a method for generating actionable insights than any lack of priority or monitoring capabilities on the part of the enterprises studied. In the b2b world, such intelligence is still sporadic and diffused, though sites like FYIndOut.com are attempting to give buyers a platform to discuss both vendor offerings and new product / service needs. Feedback mechanisms are a bit more mature on the b2c side through sites like Yelp and Epinions, though the quality of the feedback provided on such sites varies widely. The Aberdeen report also covers benchmarking requirements, competitive assessment and recommended actions for success, as well as providing several illustrative case studies. This report normally retails for $399, but is available on a complimentary basis from the Aberdeen Group here until January 1, 2010. Webinars and podcasts topped the list of most popular social media resources for business information, followed closely by user ratings (good news for b2b-focused social media sites like FYIndOut.com), company/product profile pages on social media sites, and company blogs. Social bookmarking sites (e.g. Digg, Mixx, StumbleUpon) were viewed as least important, though they are still used by 28% of respondents. Those figures hold as well specifically for senior management, with 77% listening to podcasts or webinars, 61% visiting company blogs and more than half participating in online business communities or forums. Large companies (defined in the study as having 100 or more employees) are somewhat more likely to actively used social media than smaller enterprises, though the difference varied considerably by specific activities. For example, employees at large companies were considerably more likely (84% vs. 67%) to spend time on webinars and podcasts, but only slightly more inclined (64% vs. 54%) to read company blogs for information. Not surprisingly, marketing and communications professionals are the heaviest users of b2b social media. This group is followed however by senior management, then sales, then—who would have thought it—accounting and finance. 60% of respondents report spending less than 20% of their work time using social media, with the largest single group (37%) saying they spend 10-20% of their day with it. Only one out of five employees spend 30% or more of their working hours with social media. 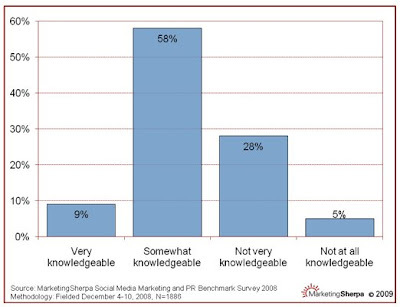 Most b2b social media users are relative newbies. 30% have used social media for less than a year, two-thirds have been active for less than two years, and more than 80% have four years of less of social media experience. Even more pronounced, on a company level, nearly 40% of enterprises have been using social media as a b2b business resource for less than a year; 72% for less than two years; and almost 90% for less than four years. Among the most popular activities for “outbound” (as opposed to research) social media activities for b2b companies, 81% maintain company accounts/profiles on social media sites, 75% are on Twitter, 74% maintain company blogs, and 73% monitor social media mentions of their companies. At the other end of the scale, only 42% advertise on social media sites and just 36% use social media for employee recruiting. 76% of b2b companies report that their social media initiatives are driven by marketing, with 13% saying customer service is the driver. In contrast, the figures for b2c companies are 63% and 26%, respectively. Finally, there is the matter of social media measurement. Among the top social media success metrics, 68% of b2b companies use website traffic as a key measurement of success, 61% brand awareness, and 60% engagement with prospects. At the other end of the scale, only 37% use prospect lead volume as a success metric (likely because social media is far more effective at brand building than lead generation) and 26% say it provides useful product feedback. The only findings that seem somewhat questionable are that 60% of respondents claimed they can demonstrate the revenue impact of social media activities and 57% said they can measure prospect lead volume. This is suspect because ROI metrics for social media are notoriously difficult to measure accurately, and because, if these measures were true, one would have expected different answers to the question above regarding success metrics. Overall, this report from Business.com is fascinating reading and a valuable resource for anyone involved in b2b social media use. Again, you can download the b2b social media benchmark study here.